I am not very keen on patronising readers with plot summaries and this would be no exception were it not for the fact that this novel’s plot is comically straightforward. It focuses on the death and burial of Addie Bundren as told by members of her family (her husband and children) as they cart the coffin to Jefferson, Mississippi to bury her among her people. The Bundren’s journey to Jefferson is conveyed to us through multiple perspectives: from the point of view of each of the Bundrens, their neighbours and members of the surrounding communities with no transitional or explanatory segments, which are conventionally provided by an omniscient narrator. What is particularly significant about this is that through the use of the interior monologue (sort of like stream of consciousness) Faulkner further challenges the boundaries of narrative possibility. My reactions to this technique alternated between a cool admiration and a I-want-to-throw-this-book-out-the-window frustration. I mean, one chapter is simply “My mother is a fish”. Darl’s point of view dominates the novel. One of Addie Bundren’s sons, his apparent clairvoyance enables Faulkner to represent scenes from the vantage point of someone not present at them, and it thereby could be said that Darl takes on the role of omniscient narrator, especially since he sees the world through a particularly rich interpretative filter, i.e. he says things like: “Upon the dark ground the chips look like random smears of soft pale paint on a black canvas. The boards look like long smooth tatters torn from the flat darkness and turned backside out”, which is richly suggestive to the say the least. The private nature of the novel’s form reflects many thematic concerns of the novel: the characters’ fundamental isolation from each other and their failure to communicate and connect with the world around them. Each of the Bundrens struggles to come to terms with the death of their mother; Cash, Anse and Jewel are less hindered by interior struggles than Darl, Vardaman and Dewey Dell are. Faulkner’s concern with form and his desire to depict the inner self as distinct from the public self is dramatised both through Darl’s ontological meditations and through Addie’s interior monologue. Her speech points to the inadequacy of words and language to describe and represent reality and to the gap between words and deeds, suggesting that there are certain feelings and emotions that reason and words cannot grasp but which, rather, can only be lived. Each interior monologue allows us to gain insight into the private thoughts and feelings of the characters as the action occurs. We also get a sense of passing time, the family’s external reality and of the social context which they inhabit. For example, there are a number of characters who do not belong to the family such as Dr Peabody, Vernon Tull, and Cora who comment on the Bundrens’ journey and offer us an outsider’s perspective. Moreover, these characters provide an emotional counterpoint to the family’s struggles and provide, at times, a different opinion on the action or a different tone. While the story is infused with a sense of tragedy and the heroic, the ending could be said to descend into farce and even the grotesque. Dr Peabody’s interior monologue, for instance, allows us to gain some ironic distance from the action. Through his point of view and the reactions of townsfolk the family meet along the way, the whole premise of the story is seen for what is it: a ridiculous journey in which the Bundren’s are transporting a decomposing and smelly corpse across miles of land and during which they foolishly decide to cast Cash’s broken leg in cement, which will surely make matters worse. Indeed, the ending seems to mock the happy marriage conclusion of traditional love stories by subverting it: Anse replaces Mrs Bundren only hours after burying her dead body (!). The final image of Dewey Dell (Addie’s only daughter) with her mouth half open and Vardaman (Addie’s youngest son) eating bananas as Anse approaches them with his new wife and his new set of teeth is a perverse distortion and descent into the grotesque which makes the journey appear futile and absurd. Those who dislike the novel sometimes mention that Faulkner’s representation of thoughts isn’t “realistic enough” or “that’s not really how people think”. While I tend to agree somewhat with this view, it’s obviously more complicated (it always is!). Some of the Bundrens—Vardaman, Dewey Dell and Darl, especially—make use of a language which is beyond their level of intelligence and social background. This is contrary to the assumption that the interior monologue grants us access to the characters’ thoughts as if they were being transcribed onto the page as they occur in the mind of the character and in a language which is faithful to that character’s persona. For instance, Vardaman famously says that “It is as though the dark were resolving him out of his integrity”, a phrase which is clearly beyond the years and education of a child. Literary critics such as R Franklin and Stephen Ross contend that this discrepancy points to Faulkner’s inconsistencies as an author and that, ultimately, it both undermines our ability to believe in the characters and in Faulkner’s representation of thought processes. Other critics such as Dorothy Hale, on the other hand, believe that this deviation from verisimilitude is indicative of Faulkner’s artistic dissatisfaction with the definition of the self implied by the form of the interior monologue. Rather than representing a “mistake”, as Franklin calls it, the discrepancy between the language the characters use and the language that is realistically available to them carries out the function of highlighting the difference between an individual’s private and public life. Hale concludes that Faulkner’s intention is to represent the inner self as something distinctly different from its public manifestation. This is most effectively dramatised by Darl and Addie. Darl’s suggestive and highly figurative language, as well as his ability to perceive the private secrets and thoughts of other characters and to narrate events at which he is not present, demonstrate that he is an unusually perceptive observer. However, his dependence on sensory and physical reality proves to be destructive and leads to his eventual breakdown. Throughout the novel, he cannot gain a sense of his own ontology and is constantly seeking to understand the nature of his own existence: “In a strange room you must empty yourself for sleep. And before you are emptied for sleep, what are you. And when you are emptied for sleep, you are not. And when you are filled with sleep, you never were. I don’t know what I am. I don’t know if I am or not”. He exhibits an increasing frustration with the elusiveness of the external world. As Olga Vickery points out, as Darl loses connection with it his resemblance to Vardaman increases; they share a mutual understanding about their mother’s death which suggests that fantasy has replaced reality. Darl goes mad because he cannot reconcile his private self to the external world; Cash is right to say that ‘This world is not his world; this life his life’. Darl’s anxieties raise many issues relating to the question of how words relate to the world they seek to represent and Addie points to the inadequacy of words to properly describe experience in her interior monologue. She says that when she married Anse “That was when I learned that words are no good; that words don’t ever fit even what they are trying to say at” and that “I knew that that word [love] was like the others: just a shape to fill a lack”. Addie desires to live life passionately but she thinks that words are standing in the way of experience. She expresses this in terms of words and deeds. Interestingly, Anse turns his word—his promise to take Addie to Jefferson—into deed, however, the journey is obviously not about Addie for him, but about correctly carrying out the role of mourner in the public’s eye and getting a new set of teeth; his motivations are entirely selfish. Despite the fact that most of the characters in the novel are illiterate members of a small, rural community the novel endows them with a profound complexity. By not limiting the characters’ use of language, Faulkner shows that their existence is both rich and varied. However, it those characters who lead less of an intense private life who are able to best come to terms with their mother’s death, highlighting how it often difficult to reconcile our private desires to the harsh demands of reality. 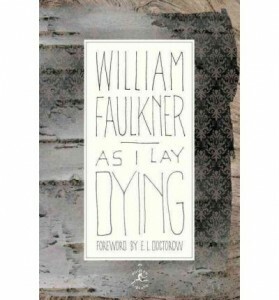 This entry was posted in Books and tagged As I Lay Dying, book, Camilla Patini, classic, fiction, novel, Review, William Faulkner, writing. Bookmark the permalink.